Austin Mobile Notary Public can help! Are you unable to travel to a Notary? For whatever reason it may be, this service is great for you! I can meet you at your location of choice to Notarize most documents. Fees are located here. Do you need a document printed out, signed, hand delivered, or mailed out? Document Courier service is available! Do you have a subpoena that needs to be served? I have experience serving subpoenas, and am able to fax / email the officer’s return. Are you in need of a certified signing agent for a home purchase, refinance, or other real estate closing? I’m certified and have a clean background check through the NNA. Do you need someone to act as an authorized representative for an I9? Per state law, I’m unable to stamp/notarize I9s, but I am able to verify identification and sign as an authorized representative. Need a vehicle inspected for a title loan? I’m able to take photos and am familiar with the process. Call (512) 588- 5333 or email me at nikolemariesturm@gmail.com for a quote! Additionally, If you do not have a document that requires a Notary, but does require a witness, I can help. Please call (512) 588-5333 for a quote on providing witness service. I have passed the examination demonstrating superior knowledge and proficiency in the administration of loan document signings. I have passed an industry-recognized background screen. I have earned the professional designation of NNA Certified and Background-Screened Notary Signing Agent. I have a Multi-Function dual-tray Laser printer that prints at 40 PPM to allow speedy preparation for signing appointments. Additional Information may be found on my profile on Notary Cafe, here. 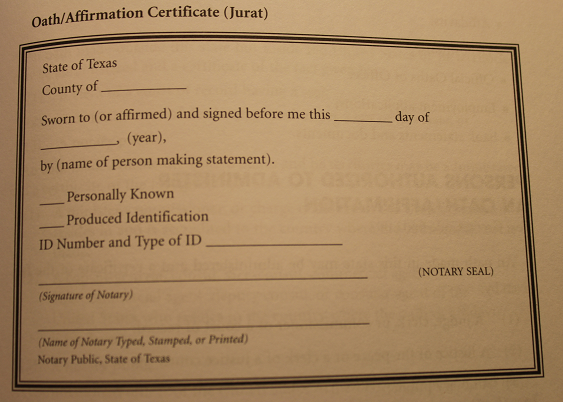 Notarize a document without having current ID from the signer, unless they are personally known to me.